The skull is one of the clearest symbols, able to represent fear, death, but also pure hedonism, celebration and attachment to life. A form that binds us all and that crosses and has inspired every cultural and religious field, in art, fashion, design, graphics, music and illustration. 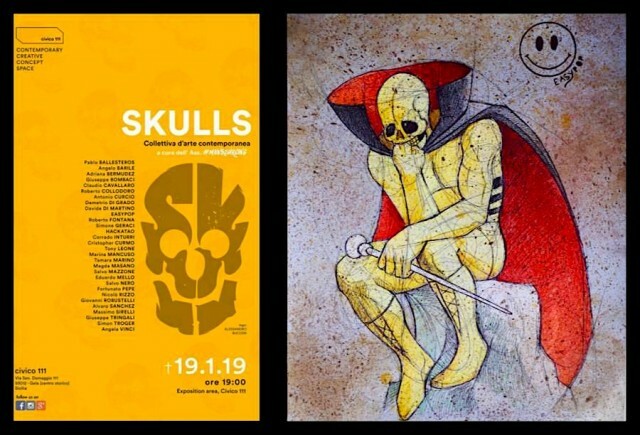 #SKULLS from graphics to painting, from sculpture to design, a collective of contemporary art inside Palazzo Reburdone / Ceramico @ Caltagirone, 32 artists tell one of the first archetypes of humanity.